The following videos are displayed using our DSM Facebook Videos WordPress Plugin. Videos below were pulled from this Facebook page videos. In this post, you will learn how to use the DSM Facebook Video WordPress Plugin. In other words, we will pull the list of videos from your Facebook page and display it to your website. It can be your WordPress site or your client's WordPress site. Our WordPress plugin will be used to achieve this output. The WP plugin's source code is based on one of our popular blog post: How To Display Facebook VIDEOS on Website? I decided to make a WordPress plugin version of that code because many people are requesting it. So here's what I came up with. You or your client is using Videos on Facebook? Don't miss the opportunity to display it on your WordPress site! Our WordPress plugin can help you with that. Through our WordPress plugin, we can display your videos from a Facebook page to your website. Automatically. In real-time. Your site will have an 'instant' videos for your customers or audience. Once you create, edit or delete a video on Facebook, your website will be updated as well. Facebook videos will be displayed as grid items with thumbnails. How cool is that? On more thing, did you know that your can control the look & feel of your Facebook videos on your website? You surely can! Our WordPress plugin has this settings dashboard where you can control colors like background colors, button color, font color and more! On the next section, let's take a closer look at the feature details of our DSM Facebook Videos WordPress Plugin - PRO Version! Do you need more reasons to download our WordPress plugin? The following are some of the features in screenshot with small descriptions. Aside from this, you can always view the live demo of our output in section 5.0 below. Please note that the following are just output preview. New features might be added or released already - the very moment you read this. List the videos from your Facebook page in grid view. This is responsive. Details include number of likes and comments, comments, comment replies and more. 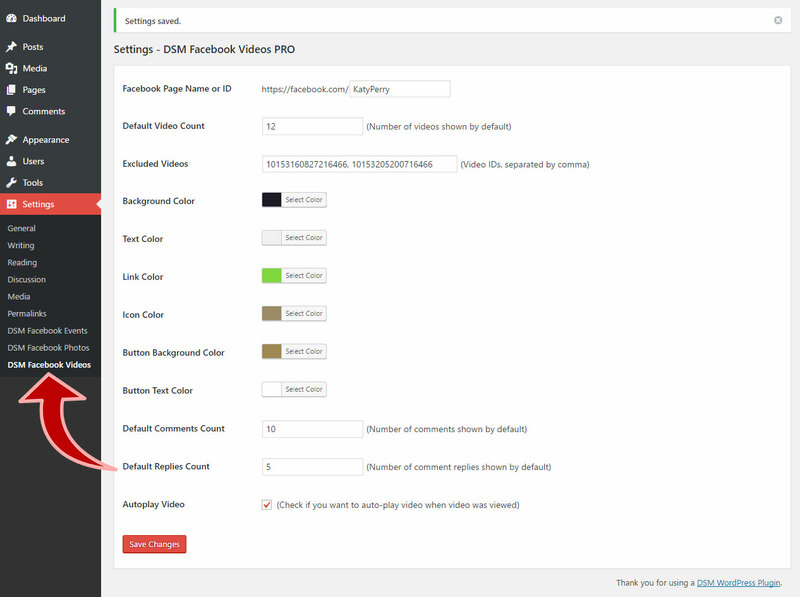 This is where you control the look and feel of your Facebook videos on your website. How to use DSM Facebook Videos WordPress Plugin? You only need 5 easy steps. 2. Upload our plugin to your WordPress site. 3. Go to WordPress Settings > DSM Facebook Videos to Customize settings. 4.2 How to display only one video from Facebook? 1. Go to the album your desire in Facebook. 2. Take a look at the URL in your browser, it looks like the following. 4. Use the shortcode in the following format. Congratulations! You just displayed videos from Facebook to your website. Enjoy the following live demo of our DSM Facebook Videos WordPress plugin. Here's what people say on our social media products. Need support? Have a feature request? Don't hesitate to send me an email about it. My email address is mike@codeofaninja.com. The following videos were displayed using our DSM Facebook Videos WordPress Plugin. Videos below were pulled from this Facebook page videos. How to Show Facebook Photos on WordPress Site? In this post, you will learn how to show Facebook photo gallery on WordPress site. It can be your WordPress site or your client's WordPress site. Our WordPress plugin will be used to achieve this output. The WP plugin's source code is based on one of our most popular blog post: How To Display Facebook PHOTOS on Website? I decided to make a WordPress plugin version of that code because many people are requesting it. So here's what I came up with. You or your client is using Photos on Facebook? Don't miss the opportunity to display it on your WordPress site! Our WordPress plugin can help you with that. Through our WordPress plugin, we can display your Photo albums and photos from a Facebook page to your website. Automatically. In real-time. Your site will have an 'instant' photos for your customers. Once you create, edit or delete a photo album or photo on Facebook, your website will be updated as well. Facebook photo gallery will be displayed as grid items with thumbnails. How cool is that? On more thing, did you know that your can control the look & feel of your Facebook photo gallery on your website? You surely can! Our WordPress plugin has this settings dashboard where you can control colors like background colors, button color, font color and more! On the next section, let's take a closer look at the feature details of our DSM Facebook Photos WordPress Plugin - PRO Version! The following are some of the features in screenshot with small descriptions. Aside from this, you can always view the live demo of our output in section 7.0 below. 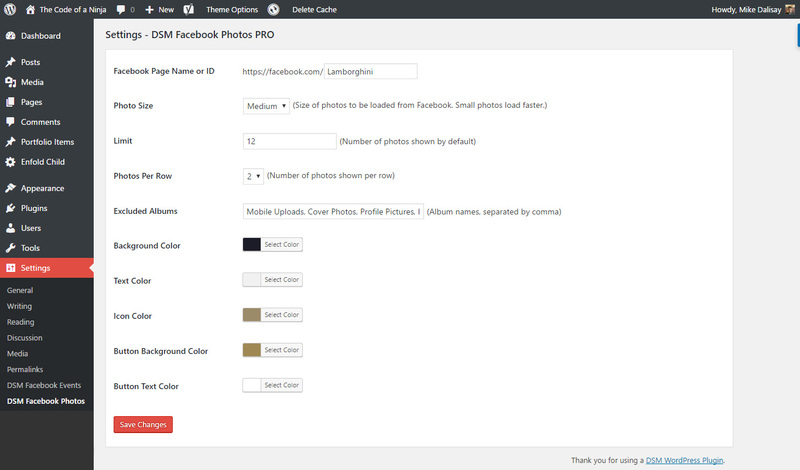 This is where you control the look and feel of your Facebook photos on your website. How to use DSM Facebook Photos WordPress Plugin? You only need 5 easy steps. 3. Go to WordPress Settings > DSM Facebook Photos to Customize settings. 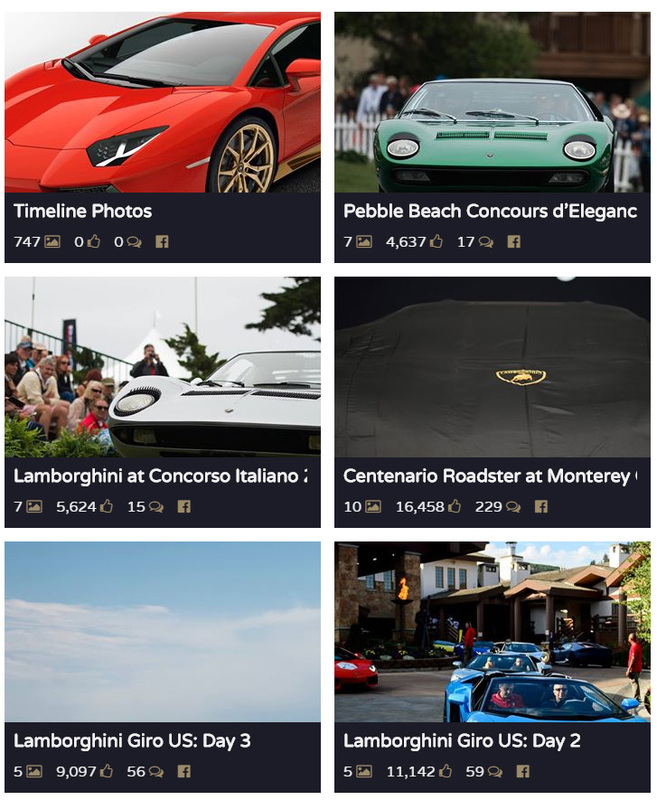 4.2 How to display photos from single photo album? Congratulations! You just displayed photos from Facebook to your website. Enjoy the following live demo of our DSM Facebook Photos WordPress plugin. https://www.codeofaninja.com/wp-content/uploads/2016/09/dsm-facebook-photos-wordpress-plugin-w-btn.jpg 628 1200 Mike Dalisay https://www.codeofaninja.com/wp-content/uploads/2019/03/codeofaninja-with-text-3-1030x206.png Mike Dalisay2016-08-30 15:32:242018-10-31 06:09:02How to Show Facebook Photos on WordPress Site? Here in codeofaninja.com, we work hard to produce scripts that works - scripts that are truly useful for your projects or business. Downloading this LEVEL 3 PRO PACK now will give you the same features and quality support as if you buy them one by one. The only difference is you get a huge discount. This pack contains five LEVEL 3 social media scripts we have. If you will buy them all one by one, it will cost you $249.95. But, if you will download this pack, it will be $198 only. You just saved $51.95! 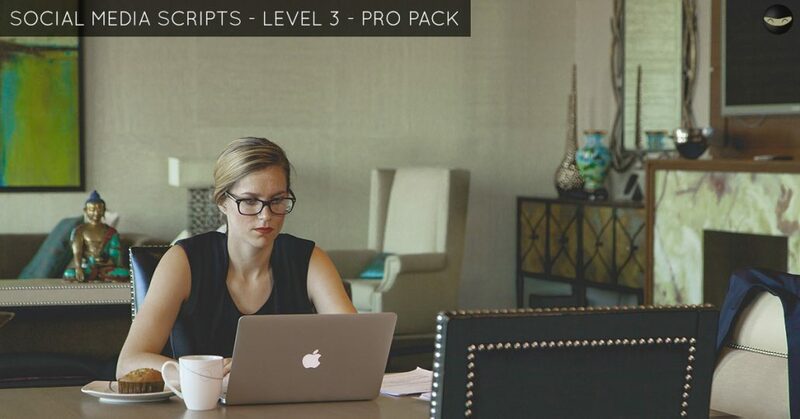 If you will buy our LEVEL 3 PRO PACK now, you will get two LEVEL 2 scripts as well! These scripts are worth another $59.98 and you get it at no extra cost! This time, instead of spending $309.93, you still get it for $198. You just saved $111.93! Get these scripts as well! What People Say About Our Social Media Scripts? If you previously bought any scripts here in codeofaninja.com, we'll give you another 15% off today! Just send me an email (mike@codeofaninja.com) with a subject "DISCOUNT REQUEST: Social Media Scripts – LEVEL 3 – PRO PACK" and I'll reply with the discount code. You don't like to code? No problem! You demanded it, we built it. A lot of people requested a website plugin version of our social media scripts. Now it is available. It works no matter what website platform you use. We have tried it in WordPress, Squarespace, Wix and more. Thank you for supporting codeofaninja.com! You can use the comment box below as well. How to Show Facebook Events on WordPress Site? In this post, you will learn how to show Facebook events on WordPress site. Our WordPress plugin will be used to achieve this output. The WP plugin's source code is based on one of our most popular blog post: How To Display Facebook EVENTS on Website? I decided to make a WordPress plugin version of that code because many people are requesting it. So here's what I came up with. You or your client is using Events on Facebook? Don't miss the opportunity to display it on your WordPress site! Our WordPress plugin can help you with that. Through our WordPress plugin, we can display your Events from Facebook to your website. Automatically. In real-time. Your site will have an 'instant' events information for your customers. Once you create or edit an event on Facebook, your website will be updated as well. Facebook events will be displayed as list view and calendar view. How cool is that? On more thing, did you know that your can control the look & feel of Facebook events on your website? You surely can! Our WordPress plugin has this settings dashboard where you can control colors like background colors, button color, font color and more! On the next section, let's take a closer look at the feature details of our DSM Facebook events WordPress Plugin - PRO Version! Our WordPress plugin can show list of upcoming events. Clicking the 'More Details' button will show you more details above the event. Our WordPress plugin can show list of past events. Events are still viewable even in mobile. Your customers can easily know your events on the current month, next month and even previous months! Clicking a date will show you more details about the event. Tabs becomes drop down in mobile view. This is where you control the look and feel of your Facebook events on your website. 4.1 How to use DSM Facebook Events WordPress Plugin? You only need 5 easy steps. 3. Go to WordPress Settings > DSM Facebook Events to Customize settings. 4.2 How to display events from multiple Facebook pages? Your shortcode will look like the following. 4.3 How to display events from multiple Facebook pages and by date? Your shortcode will look like the following. 4.4 How to display only one event from Facebook? 1. Get the event’s ID. How? Go to the Facebook event link and get the number part on the URL. 2. Use the shortcode that looks like the following. 4.5 How to display calendar view by default? Use the shortcode that looks like the following. 4.6 How to display past events by default? 4.7 How to display upcoming events with simple layout? If you want the upcoming events to be shown in a simple view, use the shortcode that looks like the following. The "all_events_link" parameter is used to render an "All Events" link at the end of the events list. Congratulations! You just displayed Facebook events to your website. Enjoy the following live demo of our DSM Facebook Events WordPress plugin. This WordPress plugin is maintained to work. But we do not add new features anymore. If you need to request and use more features, you must use another solution such as the hosted DSM Website Plugins. Any questions? Don't hesitate to send me an email about it. My email address is mike@codeofaninja.com. https://www.codeofaninja.com/wp-content/uploads/2016/08/dsm-facebook-events-wordpress-plugin-w-btn.jpg 628 1200 Mike Dalisay https://www.codeofaninja.com/wp-content/uploads/2019/03/codeofaninja-with-text-3-1030x206.png Mike Dalisay2016-08-08 05:16:272018-10-31 06:08:44How to Show Facebook Events on WordPress Site? How To Display Google Plus Posts On Website Using PHP? Millions of people still use Google+ because of its search engine optimization benefits and additional traffic for their websites. Do you use Google+ profile or page for your brand or products? Does your client use it? If you use it for your brands or products and you have your own website, it will be a great feature if you can display your Google+ feed or posts on your website. 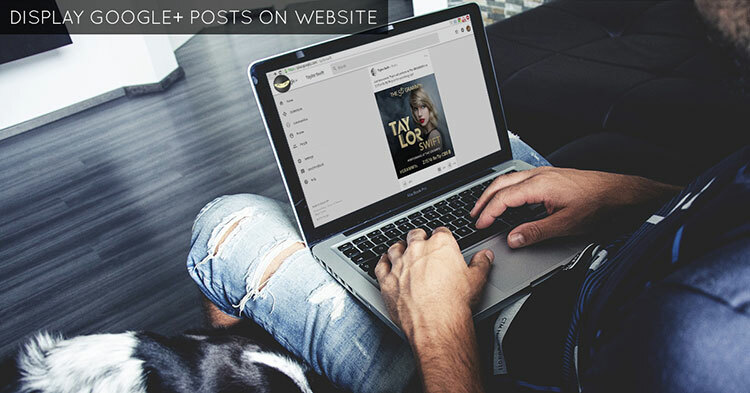 Our script for today will allow you to customize the look and feel of your Google+ posts. Don’t get me wrong, it looks good! But sometimes, our design scheme or our clients have a different requirement, they want the Google+ feed to look different. The good news is, our code for today will help you do it! 19.0 Do You Want a Demo? 1.1 It gets a Google+ information and posts from a specified Google+ profile or page. We’ll try Taylor Swift’s Google+ page in the demo. 3.2 Click the "Credentials" tab on the left menu. 3.4 On the dropdown, click "API Key"
3.5 On the pop up, click the "Browser Key" button. It should look like the following. 3.6 Enter your browser API key name and click "Create". 3.7 You should be able to view and copy your API key on the list. At the top of our index.php file, put the following code. This defines which Google+ page of profile the data will come from. Put the following code inside the col-lg-12 div tag on section 6.0. Create "libs/php/" directory. Download the Google APIs Client Library for PHP. Extract and copy the files to your "libs/php/" directory. Put the following code below section 7.0 code. Section 9.0 will not work without items_template.php, create this file. It will have the following code. Inside the foreach loop of section 10.0, put the following code. Put the following code below the code on section 11.0, this will show the formatted values of a Google+ post. Replace // SHOW PROFILE INFO HERE comment (in section 12.0) with the following code. Replace // SHOW POST MESSAGE comment (in section 12.0) with the following code. Replace // SHOW POST CONTENT comment (in section 12.0) with the following code. Replace // SHOW +1 & COMMENTS COUNT comment (in section 12.0) with the following code. If you want a demo to see if this will work with your own Google+ account, please send me a message via email mike@codeofaninja.com, or via our official Facebook page! Please provide your Google+ link on the message, thanks! Thank you for reading our tutorial on how to display Google+ feed on website using PHP! https://www.codeofaninja.com/wp-content/uploads/2016/04/display-google-plus-posts-on-website-1.jpg 393 750 Mike Dalisay https://www.codeofaninja.com/wp-content/uploads/2019/03/codeofaninja-with-text-3-1030x206.png Mike Dalisay2016-04-25 08:33:332018-01-04 09:34:16How To Display Google Plus Posts On Website Using PHP?